I had a difficult time connecting with the two main characters. I’m not sure what exactly it is about the two characters that I didn’t connect with, but I struggled to keep up with them and their adventure. 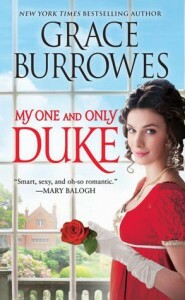 The plot was entertaining but I have liked other Grace Burrowes a lot more than this one. I had a hard time getting engrossed in the plot and conflict, though I really did enjoy how the conflict was resolved. I’m glad he got a happily ever after and that she finally stood up to her father. I will read more in this series, I just think I didn’t click with the characters and that hindered my enjoyment of the story. It isn’t a bad story; the plot is good, just not my favorite.